Posted on February 14, 2013	by Robin W.L. We are excited to share our first farm and farmer profile with you all! Each month, we will be bringing you another profile of farmer and farm, along with recipes and photos of their operations. We’ll also be checking back in with each farmer as the year progresses, and share with you planting, growing, and harvest seasons! We are so very pleased to introduce to you Ed Schneider of Pasco, WA. The Schneider’s have been a part of our farming family for decades, and are wonderful people and top-notch farmers. We hope you will enjoy learning about his farm and family! If you have any questions about Ed’s farm, please ask in the comments section! My name is Ed and my wife’s name is Liz. We have 2 daughters Alissa and Kelsey. I am the person who makes most of the major farming decisions, Liz helps out wherever she can and Kelsey does the bookkeeping for the farm when she isn’t styling hair. My oldest daughter Alissa lives in Seattle where she works for a foundation mentoring youths. I also have a partner, Grant, who is a young farmer that has become a partner in the farm with me since graduating from college, and will be taking over the farm in the future. Where do you live? What’s your farm’s name? Our farm is in Pasco, WA. We farm under the name: Schneider Farms –Pasco LLC, we don’t have farms in other places besides Pasco, we had to change our legal name a little bit because plain old “Schneider Farms” was already taken by someone else and we wanted to keep our “name brand”. I am a third generation farmer, farming full time since graduating from Washington State University in 1977. My family moved to Washington, when I was11, in 1966, leaving southern California where my father and grandfather had farmed. Why did you become a farmer? I have been around farming my whole life, I guess I really had no interests in doing anything else. I had a few jobs growing up for other people but working for another person was not for me. What type of crops do you grow? What type of farming? Our entire farm is irrigated by sprinklers. A surprise to many people,Eastern Washington is very dry in fact in our area it is considered a desert receiving about 6” annual rainfall, we have hot summer days (85 to 105 degrees) and cool summer nights (55 to75 degrees). This climate along with the availability of water for irrigation from the Columbia River makes this area one of the best potato growing regions in the world. Our potato yields can reach as high as 45 tons of potatoes per acre, but average about 31 tons per acre. Compare this to our friends in the famous potato state to the east, Idaho, where they average about 30% less per acre than we do in Washington. View on the farm. It may not look exciting now, but just wait until spring! Tell us more about your operation! We grow about 1800 acres of potatoes, 450 acres of sweet corn, and 300 acres of peas. All of our products are sold, by contract, to companies that process, freeze and sell them into the marketplace. We have 7 full time employees and we employ about 15 more at harvest time. 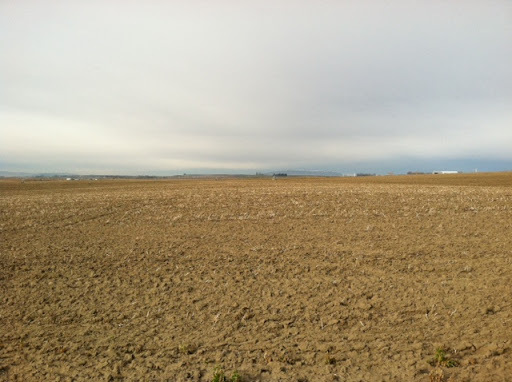 In Washington, we are considered to be mid-size in the amount of acreage that we farm. Do you use any sustainable practices? When people ask if we use sustainable practices, I have to chuckle, everything we do needs to be sustainable or we would not remain in business. We are constantly seeking technology and methods that are efficient and more sustainable. Our new tractors have fuel efficient diesel engines that use less fuel and have lower emissions than older tractors. We have equipment that can reduce the number of passes that we make through the fields saving fuel, time and money. All our irrigation systems are operated under low pressures to reduce the pumps use of electricity. We monitor the moisture in our soils twice weekly and the fertilizer levels in the plants and soil weekly, in order to reduce fertilizer and water use to avoid leaching fertilizers and chemicals into the groundwater. All chemical use is based on university recommendations as to type of chemical, frequency, and timing of use. We use conservation methods that reduce erosion from wind and water runoff. We recycle as many items we can including batteries, used engine oil, cardboard, office paper, plastic chemical jugs and others. We have in place a succession plan that will insure that the business continues to operate into the next generations. Is there something interesting, cutting-edge, or fascinating, you would like us to know? Something that stills amazes me, even though we have been using this technology for about 10 years, is the use Global Positioning Systems (GPS) to operate our tractors. Virtually every field operation that we do is run by this. The drivers in the tractors do not need to drive the tractors in the field. They push a button when they turn at the end of the field and the tractor takes over. It is extremely accurate, driving the tractor in the exact place it needs to be. When we plant our potatoes, the rows are straight and the rows are exactly where they need to be. What are the biggest challenges you face as a farmer? Farmers are constantly being bombarded with new rules and regulations, although many of these are well intended, they create a hardship and cost many dollars to document and implement. Documentation has gotten out of hand, here is an example: we buy bottled water from Costco, by the pallet, for our harvest crew, we have to document that it is safe for our employees to drink this water each time we buy water. This takes someone looking up the water on-line and placing in our files a copy of the water test that is done on that water, which is known to be safe, but we need documentation that we bought it and it was tested. Multiply this times all the different operations and purchases that we do and it adds up to many, many hours of work and costs many dollars in labor, time and supplies. What are farming’s biggest rewards for you? When we moved here in 1966 my father was a very small farmer just squeaking by. Through his and the rest of our family’s hard work, he grew and created a successful family farm. It makes me proud that I have been able to continue to operate and expand a good, successful farming operation. Do you belong to any civic or industry organizations? National Potato Council – 4 years. For 1 year I served as President, and 3 years as Legislative Committee Vice President. Washington State Potato Commission – 12 years as its Commissioner, 4 years as Research Committee Chairman, 1 year as Industry Relations Committee Chairman, and 1 year as Washington State Potato Commission Chairman. Pacific Northwest Potato Variety Development Committee – 8 years, 1 year as its Chairman. National Institute of Sustainable Agriculture (NISA) – Current Board Member. Washington State University School of Economic Sciences’ Friends Development Committee – 5 years. Do you have any farming stories that you’d like to share? When we were young, we would help my dad change the irrigation water. My brother and I would stay at the end of the sprinkler line and our dad would walk out to the middle and a start a lawn mower engine and the ¼ mile line would roll on 5 foot tall steel bicycle-type wheels for 60 feet and stop and my brother and I would reconnect it to the water supply and our dad would walk to the next line and repeat the process. I was in 6th grade and my brother in 2nd grade, and as kids do, we got bored. I talked my brother into climbing inside the wheel and bracing himself between the spokes (I being older couldn’t fit) and take a ride. My dad sees my brother flopping up and over as the wheel turns and thinks that he has been caught by the wheel and is being drug around. He runs back down to the end only to see my brother climbing out after his ride. As you can imagine that was the last time we did that stunt! 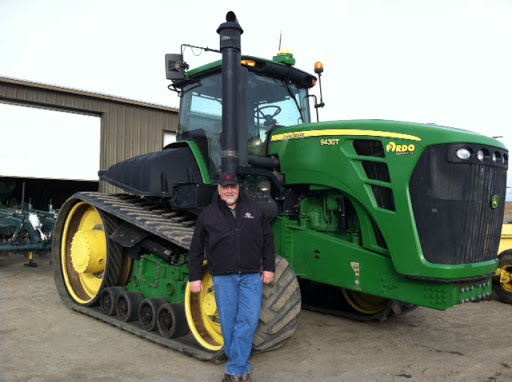 This entry was posted in Uncategorized and tagged #farmerprofile, #farming, #schneider. Bookmark the permalink. We irrigate our crops with center pivot irrigation systems that move around the field by electricity much the same as clock hands move around the face of a clock. The come in different lengths to fit in the particular field, with the average size being about 1/4 mile long, this will irrigate about 125 acres. When they are operating they move continuously making a revolution in about 24 hours on the average, although we can set them at what ever speed we need from 15 hours to say 3 or 4 days. In 24 hours we can apply about 0.4 inches of water per acre.Our irrigation water comes from the Columbia Basin Irrigation Project. It starts at Grand Coulee dam on the Columbia River, about 125 miles from our farm, where it travels through a series of man made lakes and canals to our farms. Grand Coulee dam was built by the federal government during the depression to create work for the unemployed. During the decades that followed the irrigation system was completed, finishing in the early 1970's and irrigating about 1.5 million acres. Can you tell us about how you irrigate your crops, and where your water comes from?